HILLSIDE, NJ – March 7th, 2012 NECA/WizKids, the leader in collectible gaming, is proud to announce the re-launch of the Pirates of the Spanish Main property. In 2004, Pirates of the Spanish Main defined constructible strategy games (CSG) by combining a rich back-story, constructible game pieces and elegant game play. 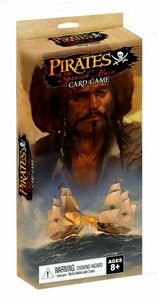 Pirates of the Spanish Main™ Shuffling the Deck™ card game will honor that spirit of innovation by launching a new card game system that uses a simple and fun twist to the Pirates of the Spanish Main history. The initial Pirates of the Spanish Main offering will be designed by Bryan Kinsella (Hunger Games, Star Trek Fleet Captains and the forthcoming Lord of the Rings Nazgul) and Phil Harding who was selected as part of the WizKids search for the next great designer. “For me it was a great first project to kick off our search for the next great designer and developer. We had a game engine for a light fast and fun game based on the Pirates property and Phil really knocked it out of the park with his simple and elegant game play designs to make the concept come to life,” said Kinsella. WizKids President Justin Ziran says “Pirates was a huge part of WizKids and created a new category (CSG) of gaming. We’re embracing the Pirates backstory and we hope it leads to bigger Pirates offerings in the future”. In addition to the first game, WizKids/NECA hopes to launch additional games in the Pirates of the Spanish Main universe, including an exploring adventure style game. A wholly owned subsidiary of the National Entertainment Collectibles Association Inc. (NECA), WizKids/NECA is a New Jersey-based game developer and publisher dedicated to creating games driven by imagination. The HeroClix brand is the most successful collectible miniatures games on the market today, with over 250 million miniature game figures sold worldwide.